When we think of the underserved market for credit, we may well think about emerging markets in Africa or Eastern Europe. But there is an underserved market even in the United States. More than 50 million people in the US don’t have a FICO® score — the standard measure of consumer credit risk. These so-called “credit invisibles” include millions of people many financial institutions would welcome as customers. But because lenders rely on credit scores for risk assessment, these people find it difficult to get credit cards, auto loans, personal loans and mortgages. This is more than a credit scoring problem — it’s a problem for society and the economy. In my keynote address at the Credit Scoring and Credit Control XIV conference, held in August and organised by the Credit Research Centre at University of Edinburgh Business School, I discussed FICO’s research into solving this problem by analysing alternative data sources. The problem is this: Credit scores rely on data at the credit bureaus. When there isn’t enough or even any data on an individual at the bureau, no score can be produced. So the question is: Given scant or nonexistent bureau data on these people, can scoring be predictive and reliable enough to separate out the good risks so lenders can confidently extend credit to them? The first step in our research was to find out if it’s possible to calculate a meaningful, reliable score for more consumers using credit bureau data alone. The answer is no – when only old data is present on a consumer’s file, the score based on that data does not meet industry standards for reliability. Predictiveness – The data should predict future consumer repayment behaviour. Regulatory compliance – The data source must comply with all regulations governing consumer credit evaluation. Depth of information – Data sources that are deeper and contain greater detail are often of greater value. Scope and consistency of coverage – A stable database covering a broad percentage of consumers can be favourable. Accuracy – How reliable is the data? How is it reported? Is it self-reported? Are there verification processes in place? Orthogonality – Useful data sources should be supplemental or complementary to what’s captured by other data sources. After exhaustive research, we were able to find data sources that met these criteria. These sources primarily provide information on landline, mobile and cable payments, and on public records and property data. We then compared scores we built using credit bureau data alone and using credit bureau data plus these alternative data sources. We scored consumers who were new to credit, but were applying for credit for the first time. As a reference, we also included a closely comparable group of consumers with traditional FICO® Score — those with new credit histories (five years or less). Results, shown in Figure 2, demonstrate that alternative data indeed offered a performance lift. 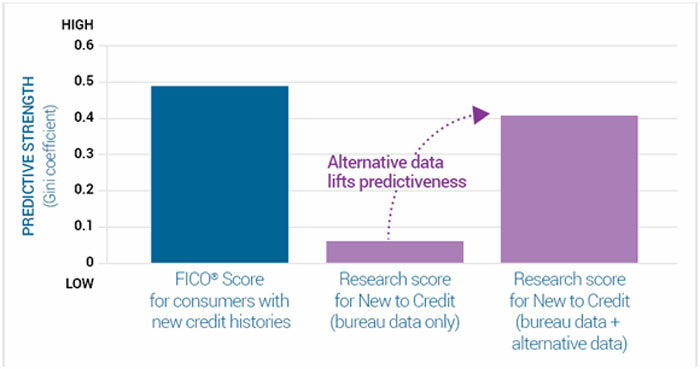 The Gini index (a statistical measure of model reliability) for the score based on both bureau and alternative data showed nearly the predictive strength of a traditional FICO® Score for consumers with new credit histories. FICO research showed that with the right alternative data, we can accurately score large numbers of previously unscorable credit applicants. In fact, more than 50% of previously “invisible” credit applicants can be scored with such a model. When I refer to a model or a score, I’m simplifying things. In fact, based on our research on over 14 million consumers, we built several models for different segments of the unscoreable population that had different payment patterns and risk profiles. We also had to use techniques such as reject inference to solve a very basic modelling dilemma. In modelling, you compare the data known about an individual when they applied for a loan with the data on how they performed. For much of our population, there was little payment performance to observe – that’s why they’re “invisible.” Fortunately, FICO is adept at techniques that are used to infer behaviour analytically based on the data we do have. Our approach of analysing alternative data with bureau data goes beyond making more consumers scorable. It reveals many creditworthy individuals who would otherwise still be stuck in the credit catch-22 — you can’t get credit without a credit history. As shown in Figure 3, more than a third of the newly scorable — millions of consumers — achieve high enough scores to gain access to credit. 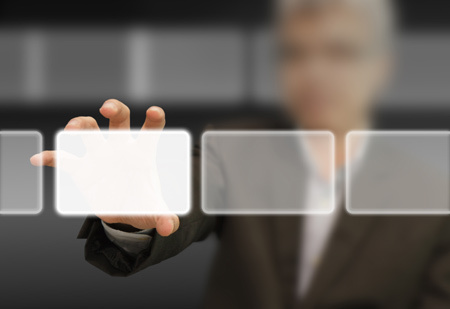 With the addition of alternative data, creditworthy individuals stand out. What’s more, our research suggests that the majority of previously unscorable applicants granted credit will go on to manage their credit obligations responsibly. 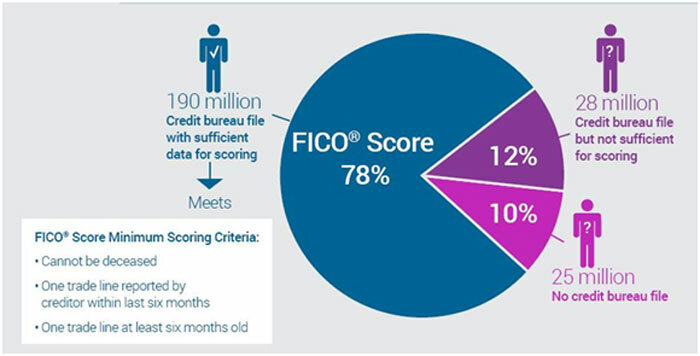 Figure 4 shows a FICO Score distribution for credit applicants who had an alternative data score of 620 or above 2 years earlier, when they didn’t have a standard FICO Score. Two-thirds have achieved a FICO® Score of at least 660, and nearly half rise above 700. Two years after obtaining credit, many of the population that previously had an alternative data score greater than 620 now have FICO Scores of 660 or higher. The FICO research in this article is the foundation for our work on a score based on alternative credit data. We believe this is a critical project that will help millions of people in the US get the credit they want. And ultimately, this work will help us expand credit eligibility in other markets as well. Dr. Andrew Jennings is chief analytics officer at analytic software firm FICO. FICO’s products include the FICO Score, the world’s leading credit bureau score. Dr. Jennings blogs on the FICO Blog at www.fico.com/blog. Lenders interested in learning more on FICO’s alternative data score can contact [email protected].